Berlin is amazing, there is just so much to do! We are staying in East Berlin, fairly close to the East German TV tower which is a useful mark to have when lost! 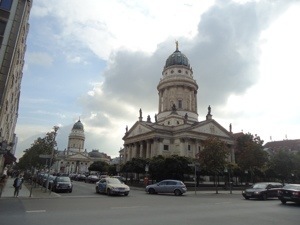 From our hostel we quickly discovered the Berliner Dom, the Protestant church of the royal family. 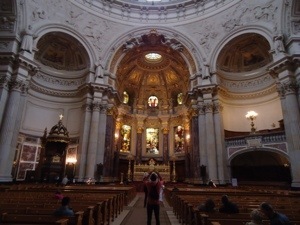 It was beautiful inside with statues of Luther and other reformers celebrated inside. 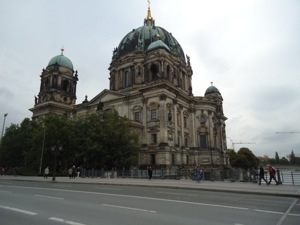 Our ticket allowed us to the roof where the views over museum island were amazing! Quite chilling considering this quote is from 1821, more than 100 years before the bookburning. 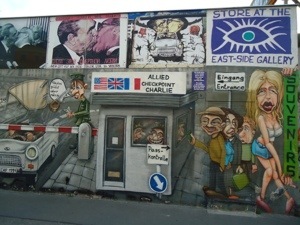 We then went to see the Berlin Wall and checkpoint Charlie. 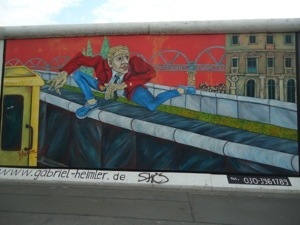 The graffiti surrounding the area was quite incredible and demonstrated the strength of feeling of the Berliners. The west side of the wall had always been quite heavily graffitied, wheras the graffiti on the east side has come since 1989. Ta Dah! Here is the Berlin Wall, underwhelming almost but strangely eerie. We had to go into a different section of the "death strip" to see these sniper towers watching over the proceedings and preventing anyone crossing. There were 104 known deaths caused by people crossing the wall and now these towers have become absorbed almost into everyday life which is surreal! The third stop in what our guide called the trifecta of tears is the joyfully named Memorial of the murdered Jews of Europe which was another moving stop. The 2000+ blocks are a reminder of the scale of tragedy. Next – the Brandenburg gate, trapped in the deathstrip for the 28 years the wall was up. This was a bustling square and also contained the Adlon Hotel where Michael Jackson dangled his baby over the balcony. It is also where David Hasselhoff played to a crowd of a million on New Year's Eve 1989 the year the wall fell! Always nice! From here we saw the Reichstag which was quite an impressive building. 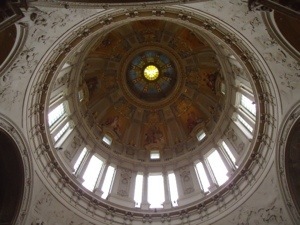 The heavy damage from the war has been repaired and recently the dome added to the top. We nicknamed this the brain! Previous We’re on our way! Love your comments on Berlin. That Wall is such a significant piece of history and yet it’s just a dull concrete eyesore. It went up almost overnight and divided neighbours on one side of a street from the other. It sounds a vibrant city. I’d love to visit it.